Towards the end of the 1960s, President Nixon, after entering the White House, wanted to improve Sino-US relations so as to increase US assets by conducting a foreign policy of "maintaining the global balance". He stressed that US policy in Asia has entered a dead alley and repeatedly expressed his desire to move in the direction of a "Sino-US rapprochement" and taking the initiative through Pakistan and Raomania to pass on messages to China. In the early 1970s, Chairman Mao Zedong and Premier Zhou Enlai, proceeding from the strategic requirements of adjusting the big triangular relations between China, the United States and the Soviet Union, sent out such messages through such means as requesting the American writer Edgar Snow to pass on the message and inviting the American Table Tennis Teams to visit China, to the effect that China is willing to have contact with the American side and to bring about a thaw in the statement of Sino-US relations. On 21 April, the Chinese Government sent a verbal message to the US Government on the US proposal of holding a high-level dialogue between the two sides:" If the relations between China and the USA are to be restored fundamentally, the US must withdraw all its armed forces from China's Taiwan and the Taiwan strait area. A solution to this crucial question can be found only through direct discussions between high level responsible persons of the two countries. Therefore, the Chinese Government reaffirms its willingness to receive publicly in Beijing a special envoy of the President of the US(for instance, Mr. Kissinger) or the US secretary of State or even the President of the US himself for a direct meeting and discussions. " In his mid-May reply, President Nixon said that in order to solve the issues dividing the two countries and because of the importance he attached to the bilateral relations, he was prepared to visit Beijing for direct conversations with the leaders of the People's Republic of China and proposed a preliminary secret meeting between Kissinger and a high-level Chinese official in China. China agreed to such a proposal which led to Kissinger's secret visit to China from 9 to 11 July 1971. The two sides discussed the international situation and Sino-US relations and reached agreement on a visit by President Nixon to China and made an announcement on 16 July. The announcement said, " Knowing of President Nixon's expressed desire to visit the People's Republic of China, Premier Zhou Enlai, on behalf of the Government of the People's Republic of China, has extended an invitation to President Nixon to visit China at an appropriate date before May 1972. President Nixon has accepted the invitation with pleasure". On 21 February 1972, President Nixon and his party arrived in Beijing and paid a 7-day historic visit to China. During the visit, President Nixon met with Chairman Mao Zedong and held talks with Premier Zhou Enlai. The two sides exchanged views on the international situation and, in particular, on Sino-US relations focussing on the Indo-China question and the Taiwan question. After repeated consultations, the Chinese and the US sides finally issued the Joint Communiqué in Shanghai (also known as the Shanghai Communiqué) on 28 February 1972. After listing the different views of the two sided on Major international issues and recognizing the essential differences between China and the United States in their social systems and foreign policies, the Shanghai Communiqué stresses that both sides agree to conduct state-to-state relations on the Five Principles of Peaceful Co-Existence. The two sides solemnly state: Progress toward the normalization of relations between China and the United States is in the interests of all countries; both wish to reduce the danger of international military conflict; neither should seek hegemony in the Asia-Pacific region and each is opposed to efforts by any other country or group of countries to establish such hegemony; and neither is prepared to negotiate on behalf of any third party or to enter to agreements or understanding with the other directed at other states. Both sides are of the view that it would be against the interests of the peoples of the world for any major country to collude with another against other countries, or for major countries to divide up the world into spheres of interests. Taiwan is a province of China which has long been returned to the motherland; the liberation of Taiwan is China's internal affair in which no other country has the right to interfere; and all US forces and military installations must be withdrawn from Taiwan. The Chinese Government firmly opposed any activities which aim at the creation of "one China, one Taiwan", "one China, two governments", "two Chinas", an "independent Taiwan" or advocate that "the status of Taiwan remains to be determined". On its part, the US side states: The United States acknowledges that all Chinese on either side of the Taiwan strait maintain there is but one China and that Taiwan is a part of China. The United States Government does not challenge that position. It reaffirms its interest in a peaceful settlement of the Taiwan question by the Chinese themselves. With this prospect in mind, it affirms the ultimate objective of the withdrawal of all US forces and military installations from Taiwan. In the meantime, it will progressively reduce its forces and military installations on Taiwan as the tension in the area diminishes. The Communiqué also stipulates that the two sides will facilitate the progressive development of bilateral trade and the further development of contacts and exchanges between China and the United States in such areas as science, technology, culture, sports and journalism, stay in contact through various channels, including the sending of a senior US representative to Beijing from time to time for concrete consultations to further the normalization of relations between the two countries and continue to exchange views on issues of common interest. The issuance of the Shanghai Communiqué signaled the beginning of the process of normalizing relations between China and the United States and laid the foundation for the further improvement and growth of those relations in the years to follow. Senior Chinese and US officials met December 4th and 5th, 2008 for the 5th Strategic Economic Dialogue. Launched in 2003, six-party talks on the Korean Peninsula nuclear issue involve China, DPRK, US, ROK, Japan and Russia. April 1971 - "Ping Pong diplomacy" kicks off when a U.S. table tennis team travels to China, thawing ties that had been frozen since People's Republic of China was founded in 1949. 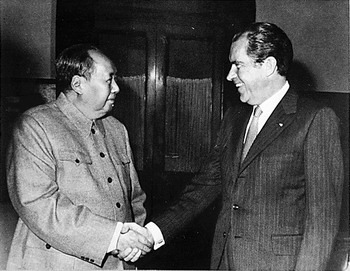 Feb 1972 - U.S. President Richard Nixon travels to China and meets Chairman Mao Zedong. The two countries issue the Shanghai Communique, laying out the "one China" policy. Jan 1, 1979 - Beijing and Washington establish diplomatic relations. Chinese leader Deng Xiaoping visits U.S. later in the month.